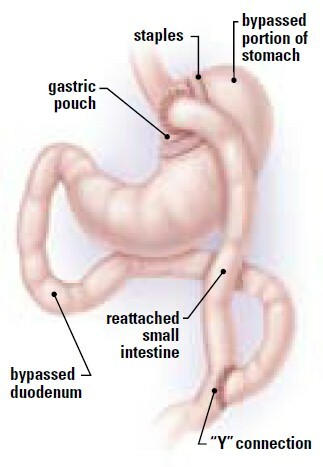 The operation creates a very small upper stomach pouch (less than one ounce) by transecting (dividing) the stomach. Ingested food passes out of the upper pouch through a small opening into the small intestine. Most of the stomach and the first part of the small intestine are bypassed by the food. Thus, the operation is termed a "gastric bypass with Roux-en-Y gastrojejunostomy." The major objective is to exclude most of the stomach. The point where the bile and pancreatic secretions are returned to mix with the ingested food is placed several feet downstream from the stomach. The gallbladder may be removed during the operation if it is found to be diseased. The operation is usually done with laparoscopic instruments through several small incisions. The laparoscopic (minimally invasive) technique involves inserting a video telescope into the abdomen through a 12 mm incision. Five additional incisions (one 12 mm and four 5 mm) are placed in the upper abdomen. The operation is then carried out using specialized instruments. The laparoscopic approach has the potential advantages of smaller incisions, less pain, quicker recovery, fewer wound complications, earlier discharge from the hospital and less scarring while potentially providing the same weight reduction as the traditional open approach. Q: How will gastric bypass help me lose weight? A: Gastric bypass will reduce the size of your stomach so you do not eat as much AND will bypass part of your small intestine so you absorb less calories. A: The typical hospital stay is two days after surgery. Q: Can I exercise or go back to work? A: We will ask you to walk when you get home, but check with your surgeon about exercise programs, driving or going back to work. Q: Will I need to follow a special diet? A: In the months before surgery, we will ask you to try to eat healthier foods to lose weight and be in better shape for your surgery. Before your surgery, you will follow a modified liquid diet that will help to shrink the size of your liver. This helps the surgeon do your surgery safely. In the hospital right after surgery and when you go home your diet will be liquids only. You will slowly begin to take other foods until you are eating many types of food. This may take up to seven weeks. Eat a high-protein, low-fat diet. Eliminate sugar and sweets, carbonated drinks and alcohol. Q: How often will I see the doctor after surgery? A: You will have an appointment about two weeks after surgery and then routine visits through the first year after surgery. After this time it is very important to see your surgeon every year. A: Most people lose 50% to 70% of their excess body weight in the first 12 to 18 months after surgery. Long-term success depends on commitment to diet and lifestyle changes. Remember - surgery is not a quick fix. It is a tool to help you with your weight loss. Q: Do I need vitamins or supplements? A: You may ned to take vitamin supplements before and initially after surgery, then long-term as needed. You will need extra liquid protein until you can eat enough food. The dietitian will discuss this with you.